Prunes and pork are a great combination. 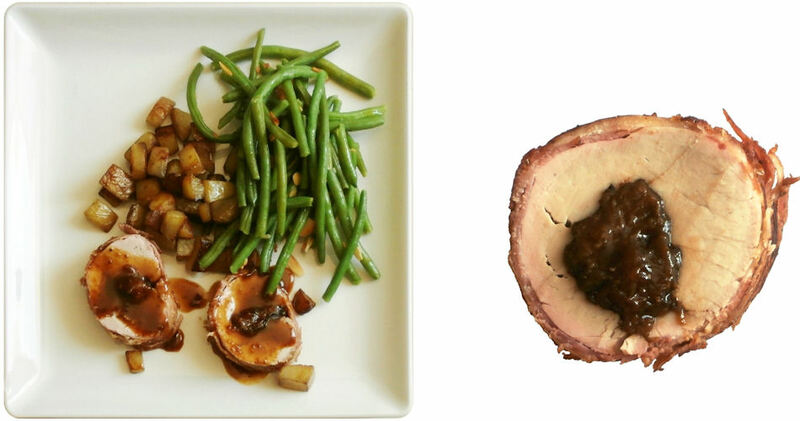 This recipe is a bacon-wrapped pork loin that is stuffed with prunes, and the cooking makes a nice sauce. 200-250 grams (½ lb) of thinly sliced bacon - enough to completely wrap the pork (about 14-15 slices)! No salt - the bacon and broth adds more than enough salt by itself! "Butterfly" the pork loin: slice the pork open length-wise. Be careful: do not cut all the way through! Put the lid on the frying pan, and let simmer slowly for 25 minutes; turn over once or twice. Note: the sauce will become very salty when it becomes thick! No obligation to eat the bacon. Note: you can also try this recipe with a mix of prunes, figs, and dried apricots.